One of the most common question ask is what is the difference between a German line and an American line German Shepherd. There is a vast difference between the two. Below I will explain some of the differences between the German Show lines, American Show lines and the European Working lines and I will show you a picture of all three. 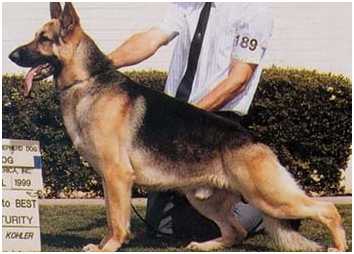 The German shepherd breed was created in 1899 by Captain Max von Stephanitz, in Germany. The captain wished to create a single breed that could serve instead of the several different highly specialized breeds farmers were using to work their flocks of sheep. He dreamt of a single, multi-purposed dog that could herd sheep, protect boundaries, defend against predators, protect the shepherd, his property and his family and still lie down in the house to play with the children at the end of the day. He set out with determination to select the best dogs exhibiting the desired traits and started building his breeding program. He was a very methodical man with a plan, and he produced some very detailed documents to guide breeders in their efforts. The standard and breed worthiness requirements are recognized internationally and most countries in the world abide by the German standards. So basically, the German shepherd dogs we find worldwide are pretty much the same and compete side by side in local shows and at the World Sieger Show in Germany once a year. The information below was used with permission from the author, Jackie Athon and any reprint must list her as author at www.4germanshep.com. The working lines are usually smaller, have very little angulation, are usually only KKL2 (permitted to breed, but not recommended to breed). 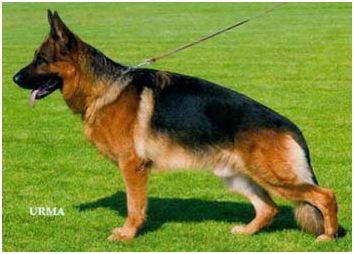 All German Shepherds in Germany must get Schutzhund titles before they are permitted to breed, so obviously both types can do the work, but not necessarily with the same amount of intensity. So what is best for you will depend on how you intend to live with your dog (kennel dog or house companion), how experienced of a dog handler you are with aggressive dogs, and how far you want to go in SchH competition. With the higher pain tolerance, the higher aggression and higher Prey drive, you had better know what you are doing and how to handle the dog in a safe manner if you want a working line shepherd. If you intend to compete in SchH 3 Nationals, you will find the working dog is more likely to get you to that level. 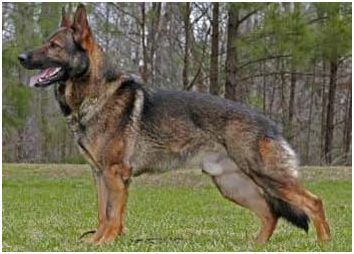 If you want a really nice quality dog with relatively easy going temperament that does have natural (but sensible) protection drives, that can make it's SchH titles with proper training, and is easier to live with and control than the Working line dog, then you will do better with the German Show line shepherd. The show lines were developed by breeders who are very focused on the structure and appearance of the dog. Although these dogs do have to obtain working titles in order to qualify for breeding, their working drives are usually lower than those of the working lines. The conformation lines are dogs that are generally easy to live with, trainable, stable, and calm, yet possessing enough drive to work and protect. The structure of these dogs is excellent, balanced, harmonious and efficient, and their general appearance is quite homogenous. They are mainly black and red, black and tan or occasionally sable. Working and show lines are still similar in temperament, with the working line exhibiting a higher drive and more intensity, making the show lines a better choice for children when placing them in a family environment. They are generally larger, softer, heavier, and have a lighter bone structure. There is often less differentiation of the two sexes, the males having less masculine heads and bodies, their angulations being quite extreme and their very structure being different from German shepherds. Aside from their appearance being quite different, the major distinction is the temperament; The Canadian / American shepherd is not a working dog. Most of these dogs do not have the required temperament to do any sort of work, with the exception of an occasional herding dog. They have gone a long way off from the temperament described in the breed standard. There is a subset of the American dogs, and that would be the "Back-yard Bred" dog (BYB). These are dogs that descend from American show lines, occasionally with some European lines mixed in, but are a generation or two, or more, removed from responsible American show line breeding. They are bred by people in their homes and backyards (hence the name) who have all the wrong reasons for breeding; puppies would be fun, the kids could experience the miracle of life, easy way to make a few dollars, and the list goes on. Not only do they usually not title or health screen their breeding stock, in most cases they aren't even aware these things exist, much less their importance. They know nothing about bloodlines or pedigrees and don't care to, though they'll often advertise their puppies in the newspaper as "champion lines". They will breed to a dog owned by a friend, family member, neighbor, or someone they meet on the street because it is easy, cheap and convenient. Most of these breeders aren't bad people, and they don't set out to produce substandard dogs. They do so out of complete ignorance of what it takes to be a responsible breeder, and the importance of thoroughly testing the health and temperament of breeding stock, and a lack of interest in educating themselves on those issues. Many actually believe that being AKC registered or having a champion or two several generations back in the pedigree makes for a quality, breed worthy animal. But while they may not intend to produce dogs with poor health and temperament, that is generally the result. Unfortunately, the vast majority of German Shepherds in North America are this type. And this is the single greatest reason for the poor reputation the German Shepherd had gained in recent years. Dogs bred by people who do not understand the breed, don't test their dogs' health and temperament, and are breeding only for themselves instead of for the betterment of the breed, are an accident waiting to happen. Many these dogs are soft, nervous, spooky, prone to separation anxiety and other behavioral problems, and weak in character. Some so much so that they are dangerous fear biters. Never get a dog from a Backyard Breeder. This is nothing but a game of Russian Roulette. Dogs from responsible breeders may cost more initially, but that is minimal compared to the vet and training fees that can accumulate due to health and temperament problems, a lawsuit caused by a dangerous dog, an the heartache that accompanies both. Below is a picture of both breeds.